Oh, John Byrne, I just can’t quit you. Try as I might, I admit it; I'll never leave your side. Back in the 1970s when you were working for Charlton Comics, I started following your career. You were the best artist on Space 1999, and I loved Doomsday +1. I followed you to Iron Fist at Marvel, and there you stayed for many years. Your tenures on The Uncanny X-Men and The Fantastic Four reset the bar higher than it had been since the days of Kirby and Lee. Then you went to DC, and for a while, you made Superman interesting and kind of fun again. Then you did the same thing with Wonder Woman. And you branched out into your own creator-owned series. The Next Men were wonderful, full of life and wonderment and I could tell you enjoyed working on it. Finally, you settled down with IDW and started working on one of your first loves, Star Trek, telling stories with a fire I hadn’t seen from you since your Fantastic Four days. I’ve tried to quit buying your stories. After every change I think, “Well, I really don’t have any interest in that but I’ll try the first couple issues and we’ll just see.” And the stories pop with energy and the sheer joy of creation and I get sucked back in. So, thank you for a lifetime of great stories. And so we come round to Stowaway To The Stars. The fine folks at IDW know how to play to Byrne’s strengths and this oversize graphic album is an excellent showcase for his work. Made up of twenty-three plates framing a science fiction short story that’s appropriate for readers of all ages, Stowaway represents some brilliant marketing and a true depth of product knowledge on IDW’s part. They know that John Byrne loves to draw robots and spaceships, and they know that his art shines when it’s printed in larger formats. Stowaway To The Stars is a fine, well put together graphics package. The story is a tight little science fiction adventure, reminiscent of Robert A. Heinlein’s juvenile fiction. It works great as a framing device for the illustrated plates, and where it could easily detract from them under a lesser hand, it works in perfect symbiosis to enhance the story. What really sets this package apart though, is the way this book was released. There’s a full- color version with some stellar color work by Leonard O’Grady, and a black and white coloring book version. Hell yeah, I bought both. If I’d had a book of John Byrne robots, spaceships and aliens to color when I was a kid It would have been heaven. What I wouldn’t give to see IDW give similar treatment to Byrne’s 1993 Deesse X-Men portfolio. 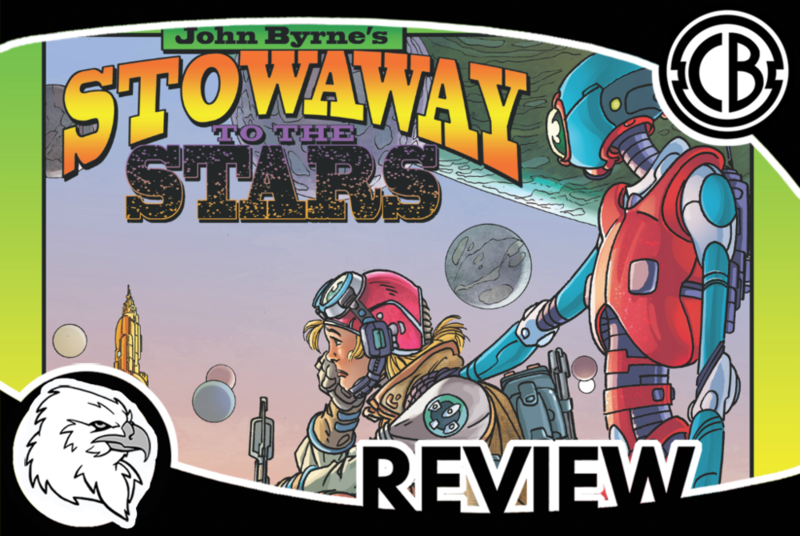 Stowaway To The Stars is a brilliant, fun comic book at its core. It's dressed up pretty, but ultimately it's simply a gorgeous piece of work. The large illustrated plates shine like the best of Byrne’s “all splash pages” comic book experiments. It’s a great showcase for his art and the subject matter is something John Byrne does better than almost anyone in the business. Stowaway is a rare treat and hopefully something IDW will do for other artists in the future.